by Martin Malden on 8 December, 2009. Last updated on 18 August, 2016. I was helping someone get their blog configured the other day and we came to setting up WP-Security-Scan – one of the plugins I do recommend. It takes you through some pretty straightforward steps that will strengthen your WordPress installation against mass bot hack attacks. One of the recommendations it makes is to change your login user name from the default ‘admin’ to something else. 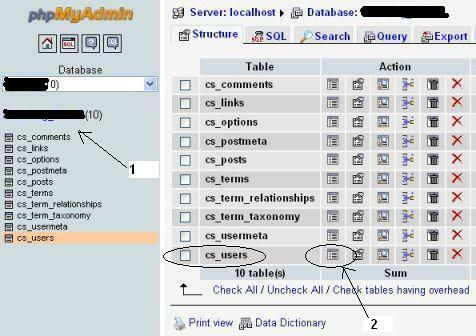 Find and click on the ‘Databases’ link (circled above). It lists all your databases on the left. 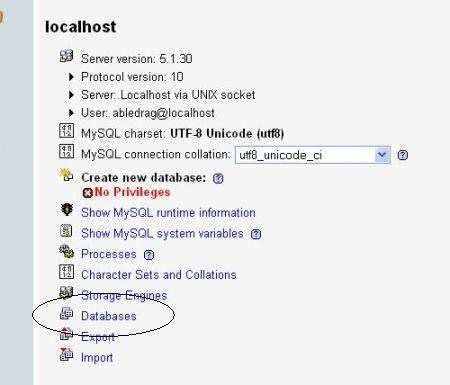 I have a number of WordPress sites, each with their own database, hence the list of databases. 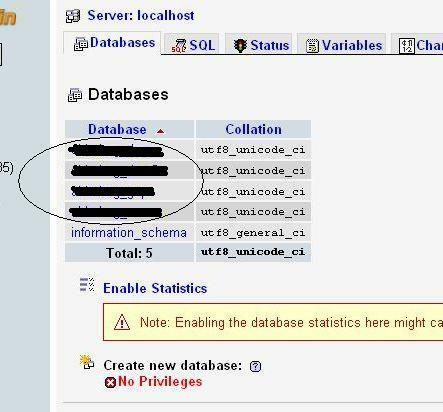 I’ve blacked mine out, but trust me – those are your databases! Look for the users table. On this site I’ve already changed the prefix to cs_, but the default prefix will be wp_, so you want the table called wp_users. 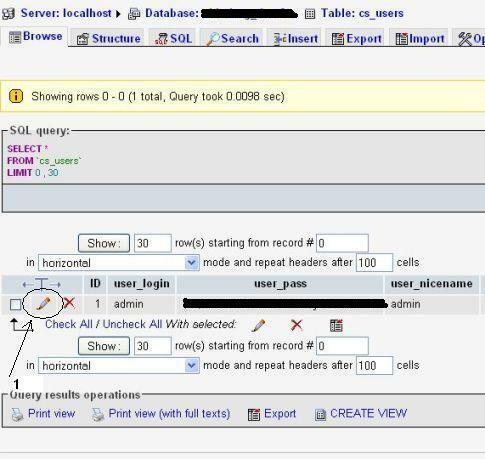 My users table is circled above. If you’re the only person with a login you’ll see just one row there. If you have others on your blog with logins, look for the one that’s called ‘admin’, and click the ‘edit’ icon, 1 above (and circled). 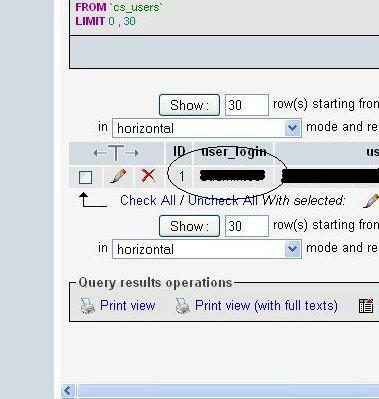 In the ‘user_login’ row above look to the right and replace ‘admin’ with a new user name. When you’ve typed a new user name click ‘Go’ at the bottom right of the table (it’s not shown in this screenshot). OK, you’re all done in PHPMyAdmin now, so you can log out if that option’s available or just close that window if it’s not. Next go to your WordPress login screen and login with the new username and your existing password. By default your nickname is the same as your username and it’s displaid as the author name on your articles. And that means anyone reading your articles would be able to see your username. So change your nickname to something different – your own name or a pen name, for example – and make sure it’s also reflected in the ‘Display name publicly as’ field. That’s it – you’ve changed your WordPress login username and made your blog more secure as a result. 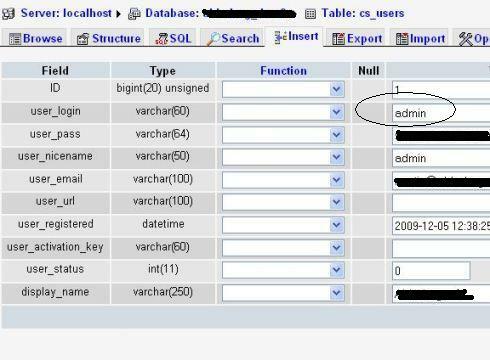 Before, I used a plugin to change the admin’s username (that was when I am afraid to tinker with the database). I guess with this one, though, you could use the plugin, make the change and then remove the plugin. Can you let us know which plugin you used, for the benefit of anyone who’d still prefer to go that route? It’s “Change Admin Username”. It is on wordpress repository of plugins. That’s what I did before.. change the admin user name then remove the plugin. .-= marvin´s last blog ..Assistance for the Victims of Typhoon Ondoy (International Name: Ketsana) =-. Thank you, thank you, thank you. I stubled across your blog and wished I found you when I started creating my new business blog! I was using a non-WordPress version for my personal blog and thought I would have no problem. I am sure I will be back often – thank you for making this so much easier! My new business blog is called simplystatedbusiness.com and is all about writing that is simple! When I get it up & running, I’ll be sure to give you a “shout out” as an example of making the difficult simple. uhhh..make that stumbled 🙂 or maybe I did stuble–LOL! !